Poorly Collected Works 2010-11 is the title of an eBook I pulled together at the end of last year. It sold a few, and jumped into the Amazon charts when it was part of a promotion, but was more of an experiment. In continuing experimentation, now Createspace is working with Amazon UK I made it into a real paperback too. 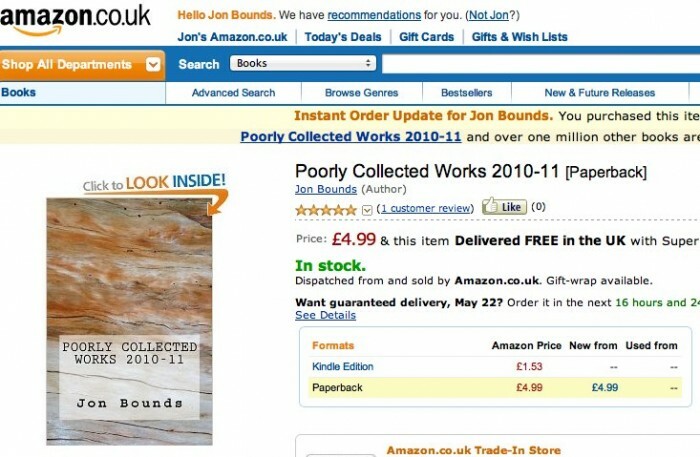 It’s available to buy now at a cheapish price . It does contain a few treats not in the similar e-book—amongst them a previously unpublished interview with Barney from the grindcore band Napalm Death, a few pieces focussed on the referendum for an elected mayor that was held in Birmingham in the early part of the year, and excitingly I think a small piece of my half of Pier Review—that real book that I’m writing that will come out sooner rather than later. Createspace also does DVDs/film downloads as well as books—it’s a fairly simple way of creating work and self publishing. You need to fiddle a little with their formatting and do a lot of checking, but it’s easy enough.